Michael Hamblin is a Principal Investigator at the Wellman Center for Photomedicine at Massachusetts General Hospital, an Associate Professor of Dermatology at Harvard Medical School and a member of the Affiliated Faculty of Harvard-MIT Division of Health Science and Technology. 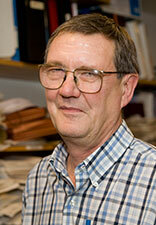 He was trained as a synthetic organic chemist and received his PhD from Trent University in England. He joined Wellman Labs in 1994. He worked initially in targeted photodynamic therapy (PDT) and prepared and studied conjugates between photosensitizers and antibodies or targeted proteins and polymers of varying charge. His research interests are now broadly in the area of phototherapy for multiple diseases. One focus is the study of new photosensitizers for infections, cancer, and heart disease. A specialty of the Hamblin lab is the development of new animal models for testing PDT approaches. The study of how PDT can activate the host immune system to attack advanced cancer is a new direction in the Hamblin lab. A second focus is low-level light therapy (LLLT) or photobiomodulation for wound healing, arthritis, traumatic brain injury, psychiatric disorders, and hair regrowth. Dr. Hamblin has published over 289 peer-reviewed articles, over 150 conference proceedings, book chapters and international abstracts, and he holds eight patents. He has edited the most recent and comprehensive textbook on PDT entitled "Advances in Photodynamic Therapy: Basic, Translational and Clinical". He also co-edited a book entitled "Photodynamic Inactivation of Microbial Pathogens: Medical and Environmental Applications", an authoritative and comprehensive textbook entitled "Handbook of Photomedicine" with 70 chapters and 800 pages, a textbook entitled "Applications of Nanoscience in Photomedicine" and another comprehensive handbook called "Handbook of Low Level Laser (Light) Therapy" is in press. Four other textbooks are in progress. Dr. Hamblin has developed an interest in elucidating the basic molecular and cellular mechanisms of LLLT, and for the past eleven years has chaired an annual conference at SPIE formerly entitled "Mechanisms for Low Level Light Therapy" and now called "Mechanisms for Photobiomodulation" and has co-edited the 11 Proceedings of SPIE volumes associated with these conferences. He is Associate Editor of 7 International Journals including Photochemistry and Photobiology, PLoS ONE, Photodiagnosis and Photodynamic Therapy and Journal of Nanomedicine and Nanotechnology. He is on the editorial boards of a further 15 journals and has peer-reviewed for a total of 165 journals. He has served on numerous study sections and grant-reviewing panels and is on the scientific advisory boards of several companies. Photodynamic therapy (PDT) is a relatively new and exciting approach for treating cancers, infections and other diseases. Non-toxic dyes known as photosensitizers are administered systemically, locally or topically and accumulate in the tumor or other lesion. Illumination with (otherwise harmless) visible (usually red light, frequently from a laser) excites the sensitizer, which in the presence of oxygen, produces reactive oxygen species that mediate cytotoxic effects. Undesirable cells such as infectious microbial cells or malignant cancer cells can be selectively killed by this approach. Dr Hamblin’s lab has set up collaborations with several chemistry groups that provide novel photosensitizers for testing both in vitro and in vivo such as bacteriochlorins, functionalized fullerenes and synthetic dyes. In recent years the Hamblin lab has developed an interest in elucidating the photochemical mechanisms that operate during PDT, focusing on the difference between Type I (hydroxyl radicals) and Type II (singlet oxygen) pathways and the factors that govern the balance between them. Low-level light therapy (LLLT) (light alone, no photosensitizer) can stimulate healing, prevent tissue death and relieve pain and inflammation. The molecular and cellular mechanisms that underlie this effect are under investigation. We believe that reactive oxygen species are also involved and cause activation of redox sensitive transcription factors. Stem cells are particularly susceptible to the effects of light and can be induced to differentiate and proliferate. Light-sensitive ion channels are another possible cellular pathway. Applications of LLLT to healing and treatment of traumatic brain injury are being studied. Results from these studies have suggested that transcranial near-infrared (NIR) light may have wide applications to a diverse range of brain disorders, including stroke, neurodegenerative diseases such as Alzheimer’s and Parkinson’s, psychiatric disorders such as depression, anxiety, PTSD, autism, and addiction. Anti-tumor immune response occurs after PDT in some small animal models of cancer. We are studying the complex interplay between factors such as the tumor type and whether it contains a recognizable antigen, the strain of mouse and its population of host suppressor cells, the type of PDT and the acute inflammatory response it causes. Combination of PDT with certain immunostimulants can produce highly synergistic benefits including regression of distant untreated tumors. Wound healing and infectious disease is being studied in animal models. The use of optical imaging of infections caused by genetically engineered bioluminescent and fluorescent microbes allows testing of PDT and other antimicrobial therapies in real time. Wound healing can be stimulated by both PDT and light alone and mechanistic and animal studies are underway. We have also used our unique animal models to test antimicrobial wound dressings such as chitosan acetate bandage and Hydrofera Blue. A broad range of antimicrobial light based therapies is being investigated including PDT, ultraviolet C and blue light in the range of 405-nm. These are being extensively studied in animal models of localized infection motivated by the widespread and inexorable rise in multi-antibiotic resistance amongst a range of pathogens. Blue light has been tested in clinical trials for H. pylori infection. Atherosclerotic vulnerable plaque may be detected and treated using a novel dual-purpose “seek and destroy” approach to be able to detect macrophage-rich plaques by use of an intra-arterial fluorescence catheter, and to potentially treat them by intravascular PDT. It is based on the targeting of macrophage scavenger receptors using a conjugate between modified albumin and chlorine(e6).